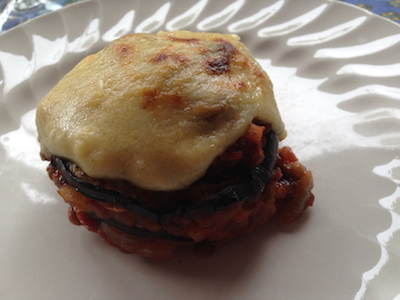 I have invented a new snack or fast-food. Someone should do a food-truck or themed restaurant around this concept. You need a non-stick frying pan with a tight fitting lid just the right size. - Put your wrap into the (cold) frying pan. - Cover and heat for a minute on a high heat then put the heat right down, do not open the lid and do not heat on a high heat for too long or your wrap will burn underneath. The secret is not to put too much topping, the wrap crust underneath has to get crispy not burnt and the ingredients on top should be cooked so if you are really hungry make two - too much topping won't work. For a more substantial snack, you can add an egg. In this case put your ingredients around in a circle and break the egg in the middle so it doesn't go walkies. We went to a car boot sale and purchased, for 5€, a SEB (c'est bien) cheesemaker machine dating from the 1960s by the look of it. Really cheesy orange and white plastic design, I don't think it had ever actually been used. 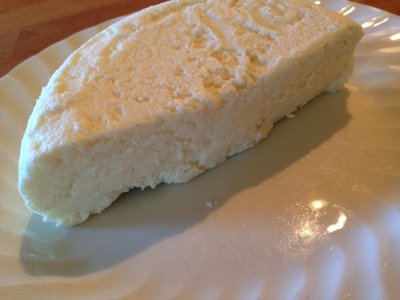 Anyway, after experimenting with a delicious goats milk cream cheese, we have just made a wonderful cheese with fresh milk from the Pyrenees (see photo). Half of this is "maturing" with a view to making a sort of camembert while the other half is getting eaten very quickly. We've had some hot spells this summer and I've been doing a lot of Mediterranean food. This is a designer variation on the classic Greek dish inspired by a travel programme I saw on TV. - Once the meat is browned add crushed garlic, a chopped chilli and some ground cinnamon, mix well for a few minutes and then add crushed tomatoes and a little red wine. Cook on a low heat. - Chop a large aubergine into similar slices (keep the skin on), brush with oil and place on the griddle with the potatoes. Depending on the size of your griddle, you may have to do all this in batches. Finely chop any left-over aubergines bits and add to the meat mixture. - Make a bechamel sauce with salty butter and flour, add a little white wine and when it starts to thicken add some milk. Sprinkle ground nutmeg. Once the sauce is cooked through and quite thick, crumble in some feta cheese and parmesan, mix well until the cheese is melted. Let the sauce cool a little and add an egg, mix well. - On an oven proof plate you now assemble the individual moussakas. I use stainless steel ring moulds to keep the shape but this is not absolutely necessary providing you take care when adding the different layers. Start with the bottom layer of potato then add a little meat mixture then a slice of grilled aubergine then a little more meat and repeat the whole process. - Pour over a little cheesy sauce and place under the hot grill until the cheese topping is browned. I have also done a vegetarian version of this recipe replacing the meat with cooked green lentils, delicious. Great loss of a real gentleman today and a great artist who, like me in the kitchen, never liked doing the same thing and re-invented himself permanently. In the mid 70's I was working in an art house cinema in Wardour Street, one day we were showing Jean-Luc Godard's "One Plus One Sympathy for the Devil" when this angel came into the cinema. Her name was Jeanette, she said she was a dancer and she lived in a squat in Regent's Park. I saw David Bowie for the first time that year, it was the time he was really playing up the bisexual thing, hanging on Mick Ronson's arms most of the time. I met David Bowie at the EuroRock Festival in Belfort France in the 1990's. We had a cup of green tea together and he complained about awful English tea with milk in it, "must be even worse with French milk", and he was wearing a dressing gown. It was pouring with rain and the stage was slowing sinking into the mud and sliding backwards towards a lake. Bowie went on stage nevertheless and gave a great performance, some songs were included in the TV show I did, it was shown all over the world. Back then I would pay in the cinema takings to Barclays Bank Regent's Street every morning where there was also an angel behind the cashier's desk, Fuzanna Wakhani, I wonder what became of her, and Jeanette of course. Then I met another angel in the cinema....but that's another ongoing story.